Recently, Nintendo president Satoru Iwata appeared at a company shareholders meeting. He looked quite thin—something that did not go unnoticed. But Iwata wants you to know he's recovering. Earlier this year, Iwata missed E3 on the advice of his doctor. Later, it was revealed that he had a growth removed from his bile duct. Online in Japan, commenters discussed how different Iwata looked. Gone was the round, familiar Nintendo exec everybody knows, and in his place was a thinner man. The above 47 News photo dates from October 30 and was, perhaps, the most concerning. 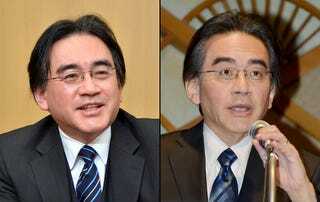 On 2ch, one commenter noted that Iwata didn't look like this during the August Nintendo Direct. "It's because he didn't have TV makeup," said another commenter. "It might be better for him not to work, don't you think?" wrote one 2ch commenter. "This is what happens after a serious illness," wrote another. "A year from now, he'll be back to his old self." "I saw many worried comments over how thin I've become. The truth is that after a major operation, I lost weight, but during these past two and a half months, thankfully my weight has stabilized, and I'm progressing well. I would truly like to thank my doctors, the hospital staff, and everyone who has assisted me." Glad to hear that Mr. Iwata is getting better. We hope everything continues to progress smoothly throughout this year and well on into 2015 and beyond.